guys, if you want to join the race you can join in the server radiators-group B. Why, when I came in 20 50 already went on the server B race of 8 laps? I spent time in vain, the organization of this race the very bad! ! What for affairs? It is told that in 21 00 we gather in a chat! ! And on the server B already race include on 16 laps in 21 00. Thank you, in vain only time I spent. Sono un pirlotto fino alle 18 di oggi facevo la prima S in 3^ poi ho capito che era meglio restare in 4^...ed ho abbassato ! Per la serie non è mai troppo tardi. Ivan_Buranovsky wrote: Why, when I came in 20 50 already went on the server B race of 8 laps? I spent time in vain, the organization of this race the very bad! ! What for affairs? It is told that in 21 00 we gather in a chat! ! 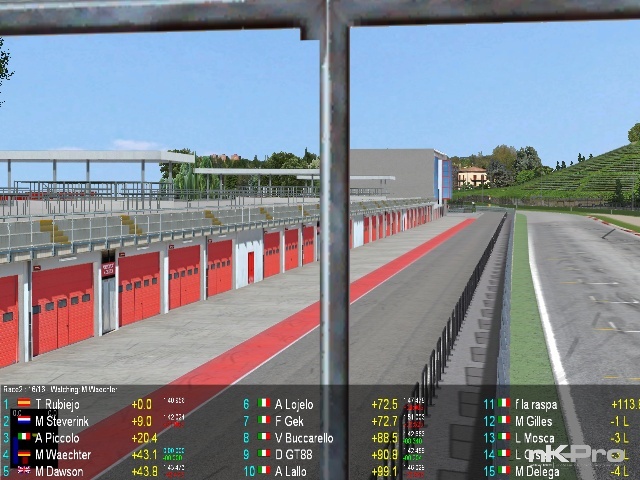 And on the server B already race include on 16 laps in 21 00. Thank you, in vain only time I spent. Discreta celebrazione per il sottoscritto. Pole e primo in gara 1 e 2° in gara 2 , molto costante senza nessun errore. In Gara 2 ho sperato in un errorino di Cristian che invece ha fatto una gara impeccabile, bravo! I'm sorry Ivan, but I guess you got lost in time translation. Race was at 21:00 CET (GMT+1), as stated in the first post. At the start of Race 1 [my personal fastest lap in there was 1.3 if I remind correctly] some cars got into an incident and were boucing around the track a litttle bit. (-It looked like as just one single car of them causing a little chain-reaction by aming a little to the left on straight & touching a car on his side, since many cars were going very closely side by side.-) I hit one of the 'bouncing' cars as he came back from the barrierer onto the track, so I had to ESC and start from behind also. Later in lap 7 I was side by side with Maarten before entrance of the aque minerale, later he somehow got wide on the tarmac extension and lost the rear and then suddenly appeared right in front of me with his 90° twisted car , front of my car was destroyed after the hit, so ESC once again. But that did not matter so much, both Maarten and me were quite at the back of the grid anyway, because of the stuff that happened at the start that I mentioned above first. Race 2 [my personal fastest lap there was a 1.5] worked better for me, some battles with Dawson, but I was still missing a little bit an even more accurate and quick pace of myself, but it was much better than my qualy [1:41.7 in already the first qualy lap, but then I made little mistakes and did not improve -still 0.9 sec off from my pb, a 1:41.1 would have been easily possible without putting in selfmade issues-, that meant pos.11 on the grid] and Race No.1. Some (three) cars crashed themselfes or lost thier control on curbs or whatever during the race at different laps, so I gained 3 positions in the later going of the race. I also almost lost my car in lap 15 -as I was going a little bit on the dirt at the last turn with that used tires, that was such kind of a heartattack moment.., but I still could catch/contol the car on the brakes on track, preventing it to silde into the opposite wall. Al contrario di buranovsky che ha evidentemente problemi di fuso orario,come fatto in chat ci tengo a ringraziare lojelo per l'organizzazione e il tempo che con evidente passione dedica alla comunita'. Sarti Cristian bibip1050 wrote: Al contrario di buranovsky che ha evidentemente problemi di fuso orario,come fatto in chat ci tengo a ringraziare lojelo per l'organizzazione e il tempo che con evidente passione dedica alla comunita'. I would like to thank you all for joining the event. It was great to go back on track for an official event after so many months. So nice to see a lot of the "old friends" and some new faces as well. Congratulations to Toni for his pole position and double victory. Astonishing lap time. I had so much fun as well, and overall 2 decent results, given the circumstances. Race 1 I arrived 5th, with a very good race. I've done just one error going wide at Acque Minerali, and loosing a position. 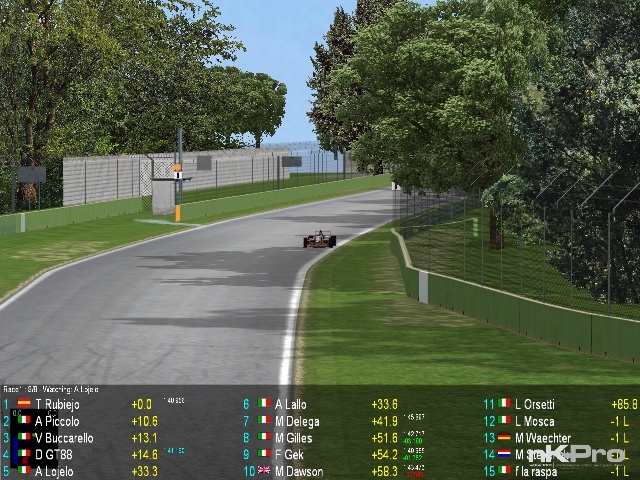 I had to crack on, to catch Antonio Lallo once more, and I finally managed to overtake him on the last lap. Good fun, great and clean battle. Race 2 on the first lap at Villeneuve, 2 cars went wide on the sand, and coming back on track one of them slightly touched me. After that I had my suspension slightly damaged. The car was still controllable, although my wheel was constantly shacking and slightly turned on one side. I decided to avoid stopping for a pitstop, thinking that that would have cost me too much time. It took me a while to get used to the car, but I was still very motivated since I had Mauro and Marco on my sight. After a long and patient comeback, with a lot of mistakes from my side due to the broken car, I managed to overtake Mauro. Great fun with the much faster Mario that overtook me twice (I a overtook him again when he did a mistake). On the last 3-4 laps I understood I could catch Franky, so I started pushing, nailing some high 1.41. When I was at 1 sec from him, he did a mistake on the exit of Villeneuve, and I managed to overtake him. On the last lap I had also Gek that gave me the position on the finish line..."because I'm the boss"
Overall, great great fun. So nice to feel the pure excitement of the official races. Thanks to all of you for keeping it nice and clean as usual. would be cool. Those are sort of my favourite tracks. Hungaroring I usually liked also, but that one we used already a couple of times. Un anno fa c'era la vecchia fisica, per questo i tempi erano migliori . AAAAAAAAAAAAAAAHHHHHHHHHHHHH Mi sembrava strano...chiarito il mistero. There will be a championship? No, so far there are no plans.., I just published my dream(s) with my favourite tracks there in that posting. Nothing more than that. Good idea about a new championship. The list of tracks is perfect would be a good fun till AC goes to online stage.